31 August — Just back from a six-day escape to Vancouver and the Lower Mainland of British Columbia, visiting much-loved family and friends in an area that always uplifts me. I say “much-loved” for many reasons, but after all these decades recognize that one of them is the resonance added by sheer passage of time. Part of the worth is in the while — a concept I borrow from John Fowles, who first deconstructed “worthwhile” this way in his 1964 book of personal philosophy, The Aristos. Count back on your fingers and, yes, I posted “King, Queen and Moose” not from Toronto, but from the home of my friends Sally and Owen in North Vancouver. I sat there at Sal’s laptop, looking out over their back yard to the fence dividing it from the trees and shrubs of Mount Seymour Provincial Park immediately beyond. The shrubs include blackberry bushes, up against the fence. 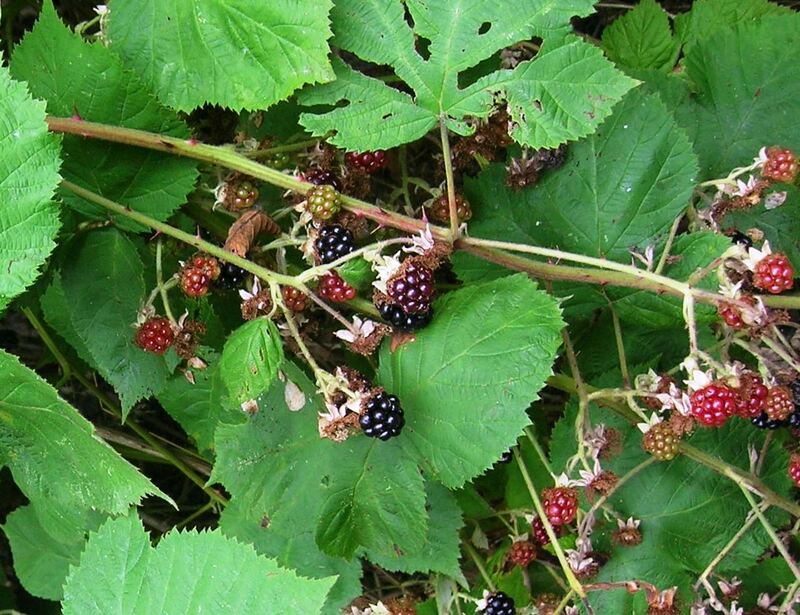 Which means ripening blackberries are more than a sign of changing seasons, they signal potential danger. Black bears love blackberries, and literally turn gate-crasher on occasion, once they’re that close to residential properties with other potential sources of food. Of course the visit included some hiking about! You can’t be in British Columbia, halfway up a mountain, and not go walking. First target, Old Buck Trail, which sets off halfway up Mount Seymour Road. Various other trails split off, such as this Empress Bypass option, but I stuck with the main trail. I hadn’t brought my pedometer, and settled for a 90-minute outing instead right on Old Buck itself. 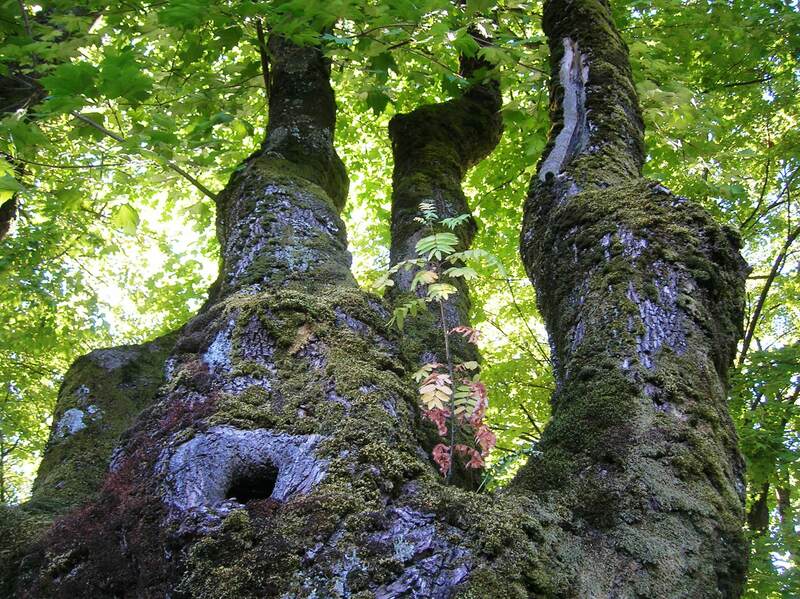 First I went up (and in these mountain ranges, up is up), awe-struck by the huge stumps of long-ago trees. Yes, I’ve seen them before, but they never fail to move me. Somewhere beyond here, short of the Baden Powell junction but not by much, I turned about. At least as high as I went, the trail was much like this — a smooth, clear dirt path. Just as the ancient stumps move me, so do the great columns of contemporary tall trees. The path moves gently among them, and I think a bit about paths, and making one’s path (thank you, Antonio Machado), physically and otherwise. I remember, too, that tai chi is sometimes described as “walking meditation.” I don’t specifically meditate when I walk, but I do usually feel myself expanding out into my surroundings, somehow. 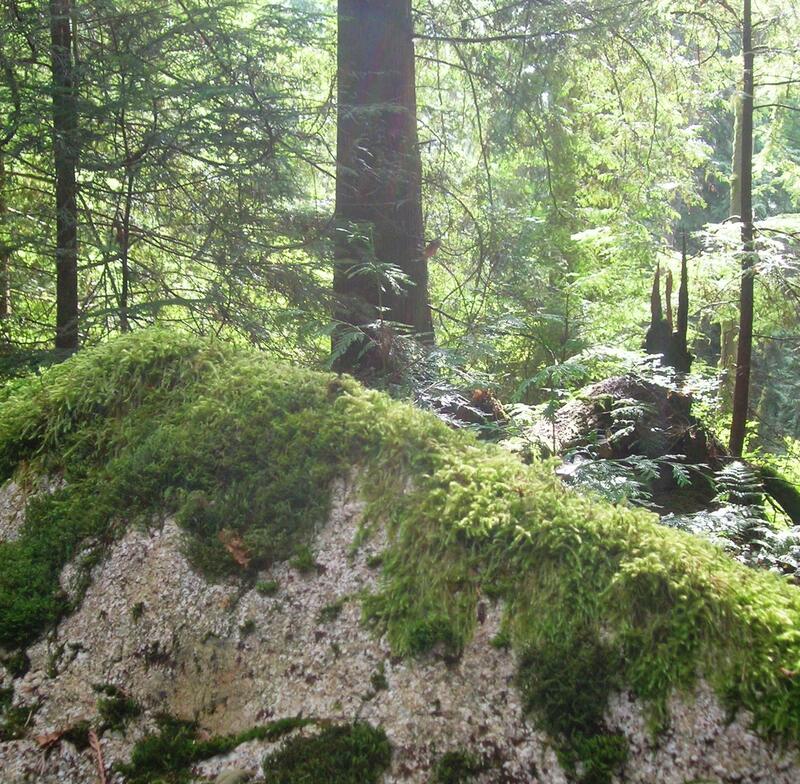 Then, sometimes, the elegant columns of trees give way to great bursts of nature’s very own mixed media: rock and moss and other layered vegetation and spikey remnants of old logs and forest, forest, forest. But no, I don’t spend the whole six days in the woods. Soon I’m deserting this far corner of North Van for a visit to Vancouver proper — across Burrard Inlet by Seabus, then south on the Canada Line (built for the 2010 Vancouver Winter Olympics), and out onto Cambie St. at Broadway. Where I grabbed this shot northward up Cambie, sightlines back to North Vancouver and the framing mountains beyond. Mountains and ocean, Vancouver is the Rio of the north. My friends waited cheerfully while I eyed the detail of growth on city trees. Like this one. We had lunch one place, lattes somewhere else, prowled shops with strong design sense… and finally good-bye and back north I went, retracing my way via the Canada Line to the Seabus again. 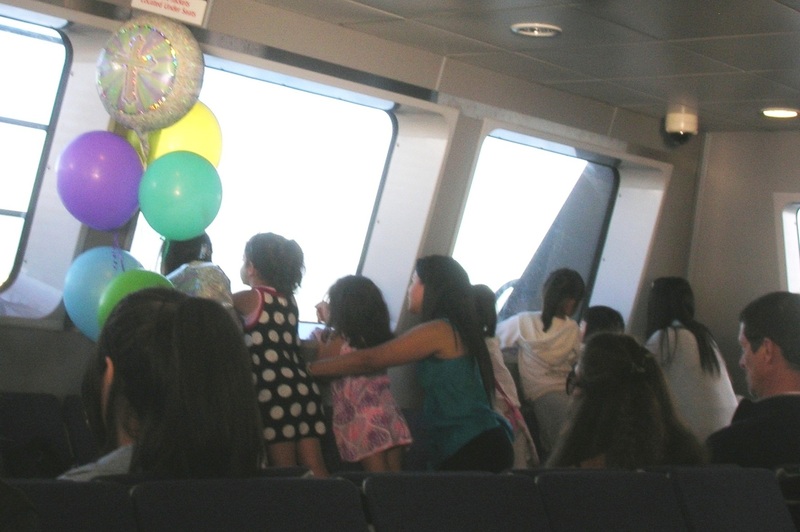 Where I was charmed by these little girls, their noses pressed against the ferry’s front window, party balloons to one side. Another walk, still in North Van and on Mount Seymour, but setting out from the little community of Deep Cove. 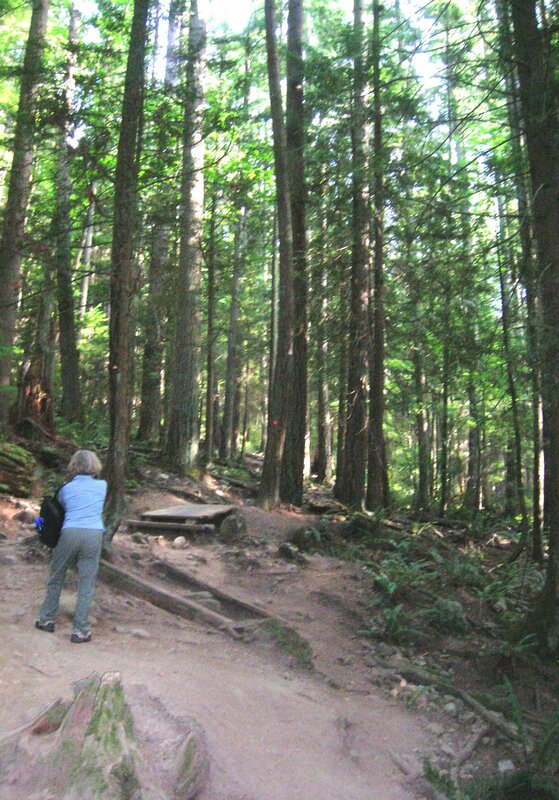 That’s Sally’s back, in an early stretch of our chosen hike, up the Baden Powell Trail to the Deep Cove Lookout. The lookout is aka Quarry Rock — indeed a succession of big old rocks, but no sign anywhere of past let alone present quarrying. So, go figure. Sal characterized this as an up-and-down trail, probably an hour each way. The footing was at times smooth and the path gently curving, but in other places the path twisted narrowly among trees and boulders, intensely scored with tree roots and rocks. It was also much less solitary than my Old Buck outing! Then again, a weekend morning vs weekday. More people than we really wanted — oh, the cherished illusion of being alone in nature — but at least everybody observed pretty good trail etiquette. Finally there we were on Quarry Rock, looking over the Indian Arm inlet of the ocean, with the village of Deep Cove itself hidden away to the right. Going back down, I lost track for a moment. So many ups and downs enroute… where we really descending? Yes, we were. Sometimes on the twisty paths I described above, sometimes on stairways pressed against rock faces, like this. 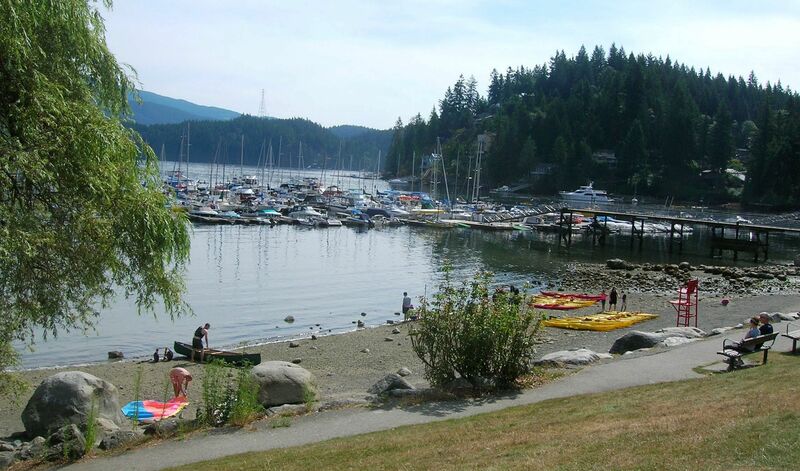 Yah, finally, indeed down and walking along the Deep Cove beach, with all the boats bobbing in the water and great red and yellow blocks of kayaks set out, waiting their turn for some action. We consider hanging around for Deep Cove Daze [sic], but resist. It’s going to be all the usual late-summer, small-community mix of booths and games and noise and T-shirts and organizations with their tables… and it is tempting… but we have other plans. Which involve lunch on a patio elsewhere, so it’s easy to leave. 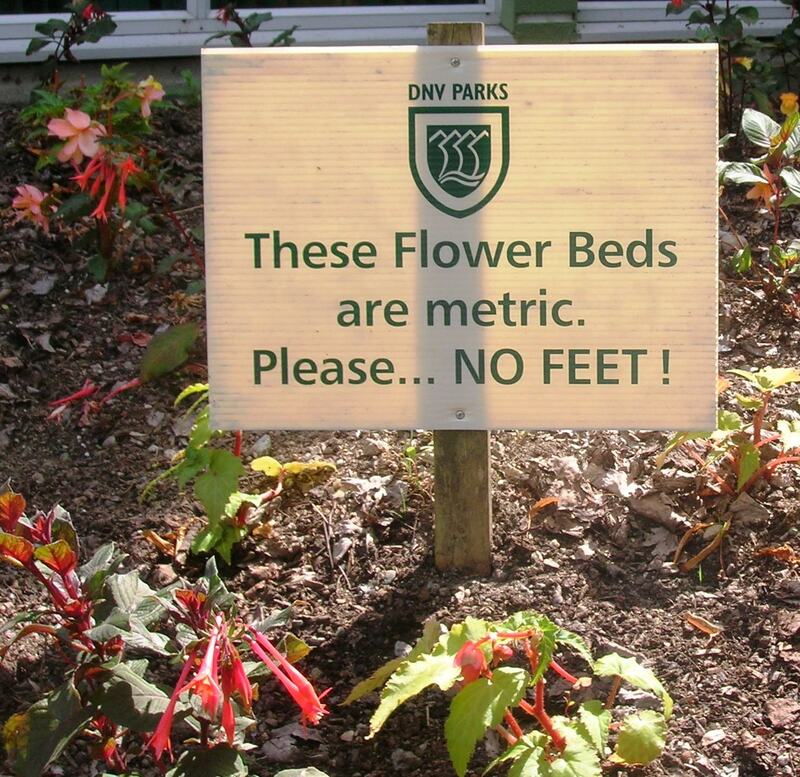 But not before paying tribute to this metric flower bed! One last walk, days later and down in the Lower Mainland where I’ve joined family for the final few days of my trip. Karen and I head out to Watershed Park in Surrey, one that she and husband Tim know well, both on foot and on their bikes. At first I tut-tutted, a graffito in such a setting. Then I realized I rather liked the face — just a bit Picasso-esque, don’t you think? And also realized it is if anything an improvement on the concrete ruin it adorns. This last photo takes us back to West Coast Classic, and is a bit of a cheat. Well, only in time, not in place. 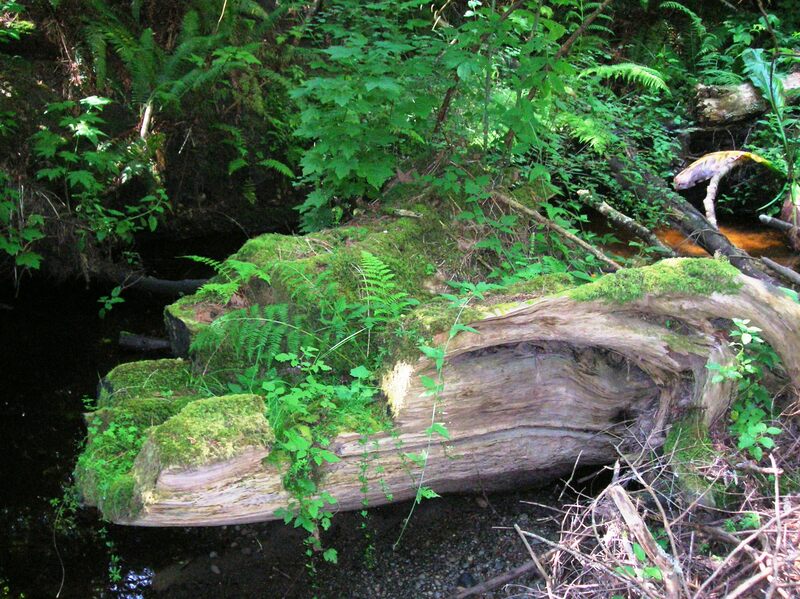 I took this photo of a “nurse log” right here in Watershed Park, but some years ago. Karen had explained the phenomenon to me, that of an old rotting log nurturing new life, and I remember being so happy to find such a good example of it. What fun to see the pictures and your story, Penny. It was a great visit. Wonderful blog! Congrats on Freshly Pressed! Wow, thank you! this is a first!! Thank you! I don’t think of myself as much of a photographer, but when you have this kind of scenery, you try to rise to the occasion. 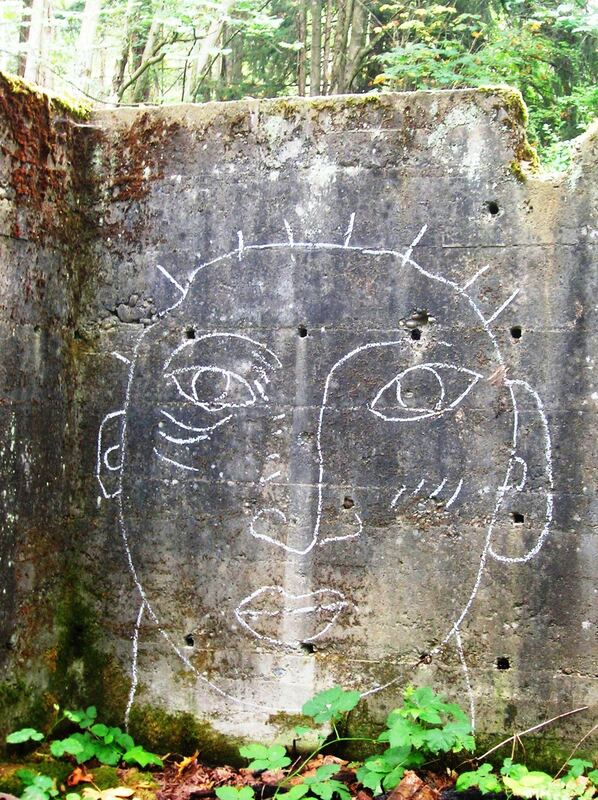 The graffiti face looks Native American to me. 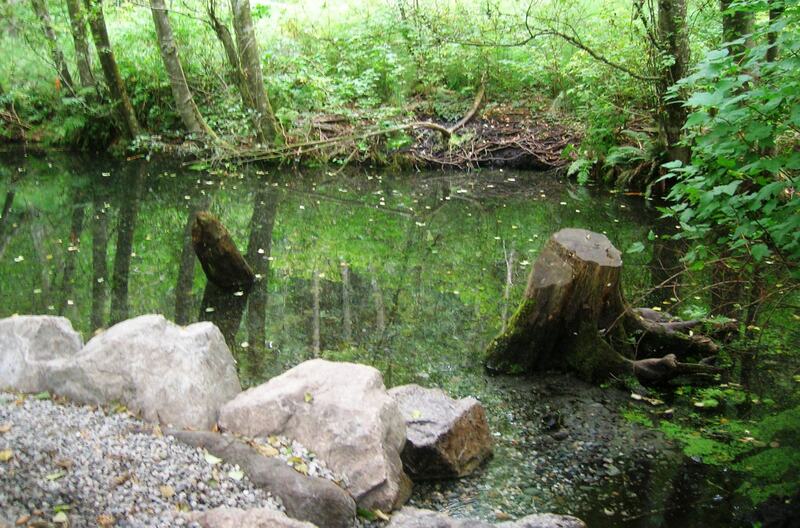 And nurse log – a lovely concept. That face… yes, perhaps! I was influenced by some video footage we had at the Art Gallery of Ontario, associated with the recent Picasso show, which showed him doing some freehand continuous-line drawing on a clear panel between him and the camera. I’m not calling this anonymous artist a Picasso, but I felt that he too had a sort of minimalist grace to his lines. If you’re interested in indigenous culture and art, I hope you’ll back up in my posts to read the 2-3 I wrote about the First Nations mural project that is just now being completed in Allen Gardens, near my home. The post titles all start with, “All My Relations.” I was deeply impressed both by the quality of the art and the depth of culture being expressed. Thanks! I’m always so happy when something I’ve noticed has meaning for someone else. Mmmmm, I can almost smell the B.C. air when I look at your photos, especially of the ocean. If only I could click my heels together and go home to all that unpolished beauty. Ah yes, click those heels. Well, you can go there any time, in your heart and in your memories. And meanwhile, I hope you’re exploring and enjoying wherever you live now. happy trails to you and your readers. Thank you for that quote! I’m beginning to notice and collect quotes about paths, and personal discovery and our lives (hence the Antonio Machado and Marcel Proust quotes on my home page); I’ll add this to my collection. Wonderful landsacapes! Hope I get to explore the place in not to long! I hope so too. But meanwhile, explore wherever you already are. Bring to it the “new eyes” mentioned in the Marcel Proust quote in my home page sidebar… and it can be amazing. Love these photos. I am so inspired to go out walking now and really absorb nature. Thanks. And the great thing is, nature is right there, outside your own front door. We just have to open up our eyes, and really look and see what’s around us. So go have fun! You don’t need to wait to have the time and money for big, long outings somewhere far from home. Just starting doing some short walks, right from your own front door. Go with curiosity and open eyes, and it can be amazing. Beautiful place with beautiful scenaries, I was wondering if you would recommend this place for honeymoon? This is a wonderful perspective on Vancouver. My daughter goes to school out there and the beauty does not escape her eye or her other senses. It is a very different place that everyone needs to experience! Thanks! Each region, each place, has its own distinctive magic. I love BC and Vancouver a lot, but am also constantly wowed by what I find around Tooronto, which is so very diffrerent. Without a doubt. I’ve started reading through your older posts and share your appreciation for this great city. My son lives in Kensington Market which you wrote about beautifully. Can’t wait to read more! Paula, this is terrific. The more I walk, the more I appreciate the particular strengths right here in Toronto. Each place has its own magic, if we’re willing to be open to it. I know, it’s a city that fills all the senses. Moreover, where you talked abt you expanding out in the surrounding, I found that a beautiful expression… I can totally relate to that feeling, I feel I find myself during my walks and in the midst of nature..
and ofcourse the place looks gorgeous!! Thanks for sharing your thoughts, I’m happy to find other people feel the same way I do about being out in nature. And do try to find a copy of The Aristos, it didn’t get much attention but I thought it worth reading, especially the first half. Thanks… and I’ll check it out. Thanks for taking time to say so! …superbly written post! next time, if youre looking for even more stupendous country, i would suggest looking at the Charlottes…very few people visit those places and im sure you will find it very peaceful! I love the Queen Charlotte Islands… Haida Gwaii… I have wonderful memories. My partner and I went there more than a decade ago, and you’re right, it’s time to revisit. great to hear that! i often dream of finding a secret place there for myself where nobody will ever come and live off the land…..just dreams! I lived in northern Vermont, have been to Canada a bunch of times, love the pics! Thanks! come see us again! I’ve been meaning to plan a road trip through the Pacific Northwest US and BC. Thanks for sharing! Yeah I’ve heard good things about Portland as well! Thanks Annie. I have no photography background, so I’m always grateful to learn that my photos add to the story. That was a one-week visit to Vancouver, and before that, Iceland was a 10-day visit. Mostly I’m at home, walking & exploring my own city, so that’s what most of my posts will be about. I believe every place can be magic, if we engage our curiosity and really look, and see. So go have fun! That’s true, any place can hold a secret. Thanks. Beautiful pictures! 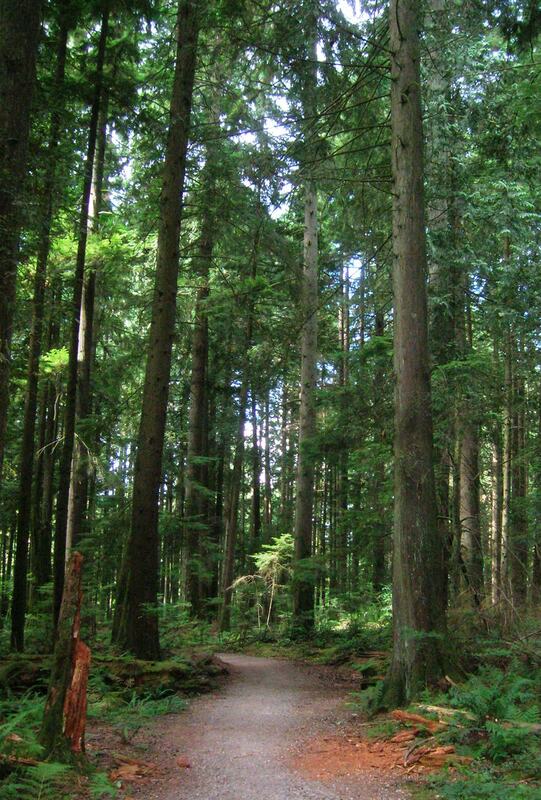 They my feet itch with longing to be walking those trails…. Phew! You had me anxiously wondering how I’d missed a typo in my own proofing! Thanks for the comment. Let’s all get out there with our itchy feet and curious eyes, and appreciate the wonder around us. 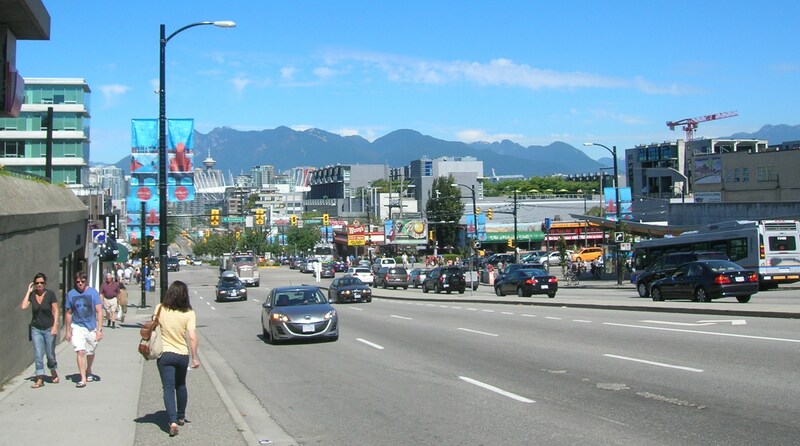 I grew up in Toronto (now in suburban NY) but have been out to Vancouver (my birthplace) several times. The landscape is so lush and gorgeous; if you haven’t yet visited Tofino and Pacific Rim National Park, they are amazing. I loved your description of “nature’s mixed media.” Every time I walk or bike, I see something beautiful and refreshing. Glad that I grew up in such a great country with people who so appreciate nature and being out in it. Yes, I have been out to Tofino and the Pacific rim National Park, as well as spent time in some of the islands, such as Gabriola and Denman (etc)… so I’m a big fan of “Super Natural B.C.” (to quote the old marketing campaign). I’m also a big fan of where I am right now. I’m all for everyone enjoying each place for its own attributes. Thanks for your comment. Thank you for the post and photos! I have just moved away from Vancouver and it was lovely to see my favourite walking and running spots through a different lens. You sure do get around to some fun places. I’m happy it brought back good memories. I had a wonderful time. I think I’ve decided that every place can be wonderful, if we approach it with curiosity and respect. The photos and text were very evocative. I’ve never been to Vancouver, but have wanted to see it. Your pictures conveyed the flavor of exactly the aspects I like to see. Thanks. Lovely pics. 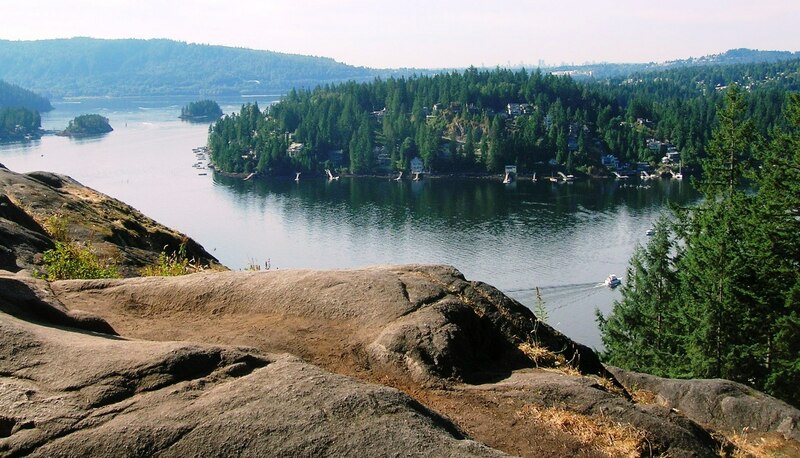 Is Quarry Rock near Horseshoe Bay? I think the best fish and chips I ever ate were from a little stand in a park by the water there, waiting for the ferry to Nanaimo. BC is just so beautiful, it’s unreal. Oh yes! I love Nature!!! Thanks for your comment, and oh… I sure will keep walking. You’ll see! “The best month to hike? “Weather wise – summer and early fall. Like right now – September days. No bugs, warm during the day. “June can be rainy – unpredictable – but you get the light into the evening. “July and August are great – along the coast it’s temperate and not as hot as Ontario. Places like the Okanogan are much hotter in July and August, so I’d steer away from that location during those months. “So… mid-August to mid-September, I’d say. You trade of shorter nights for consistent weather. Looks like an amazing voyage. Thanks for sharing! I hope your friends took you to Honey’s Donuts while you were in Deep Cove. 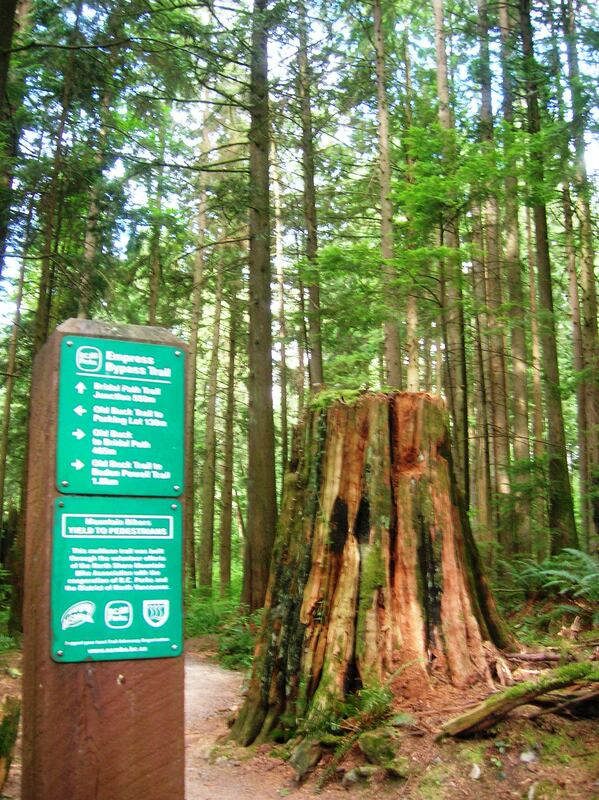 There is also the Baden Powell Trail from Deep Cove to Horseshoe Bay, next time you are in the area. Hi Keith — No, and yes. No visit to Honey’s Donuts (I must speak to my friends about that), but yes to the Baden Powell Trail — that’s the trail we were on, except we only followed it as far as the lookout. My friends however know it higher up as well. And thank you… Sharing is what we do, right? I enjoyed reading your adventure. Thanks, Chis — and I enjoy sharing my adventures. I never saw this before but agree with it in a few different ways and more than one level. I agree this quote by Machado is a multi-layered observation, and that’s why it has stuck in my mind ever since I first saw it in the 1970s. Lovely post! I can’t wait to make my way over to that side of Canada, the photos themselves are breathtaking. Thanks for your interest and support, Cindy. So many people have wonderful memories of the BC coast (or want to go there and create some), thanks for sharing yours. As for my photos… it’s the scenery that’s beautiful, all I did was press that little button!